In the previous set of videos we built a theme from scratch. But that's actually a pretty rare thing to do. It's important to do it at least once so that you have a sense of the different components in the anatomy of a theme but most of the time what you're going to do is either copy a theme and adjust it or create a sub-theme. And so in this section what I'd like to do is talk about the advantages of creating a sub-theme and why you would want to do it and then we'll move on to a demonstration of how to do it. It's actually very simple. The idea behind a sub-theme is that you can create a theme folder and set the info file such as it inherits everything from another theme. And you can do this with any theme. What that means is that then pretty much all of the assets of that original theme get pulled into the sub-theme but then you can override just specific aspects of it. So for example, you want to override some of the CSS, you can do that without modifying the original CSS or messing that up. You can add additional image files if you wanted to change things around. And the advantage here is that you can leverage existing code and you don't have to fork that code. And by forking, I mean creating a copy and having to maintain it. 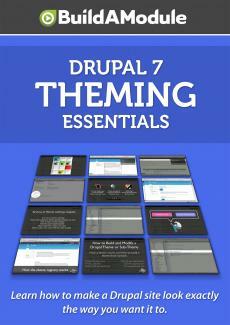 Some themes are built in such a way that it encourages sub-theming. And that original based theme is highly maintained which means that if there's any bugs that occur inside of it someone will likely fix those bugs. If you're using a sub-theme, it means that any fixes made to the base theme get pulled into the sub-theme as well and you don't have to do anything about that.